After School & Saturday STEAM Programs for Kids in Westchester, NY at The Digital Arts Experience (The DAE). We strive to stay cutting edge, which is why we’ve introduced new classes this Spring including: Tabletop Game Design, It’s Alive! Bringing Monsters to Life with Blender, Product Design & more! Enroll in either 6 or 12 weeks of a course. Weekday programs are 90 minutes long, weekend are 2 hours. Our programs follow DAE curriculum designed with STEAM fields in mind. We want our students to have fun all while learning the most up to date digital arts and technology skills! Starting March 7th, we will be offering a whole new set of youth programs. From 3D Printing to Animation, have your child explore their creative interests in one of our after school or weekend programs. The DAE isn’t just for kids. The Digital Arts Experience of Westchester County is offering adult programs this Fall. Spring Break STEM Drop-Ins for Kids in Westchester at The Digital Arts Experience in White Plains, Westchester, NY in 3D Printing, Animation, Python Coding, Scratch, LEGO, Minecraft and Visual FX! The DAE’s Mobile STEM Classroom Rolls through Westchester! 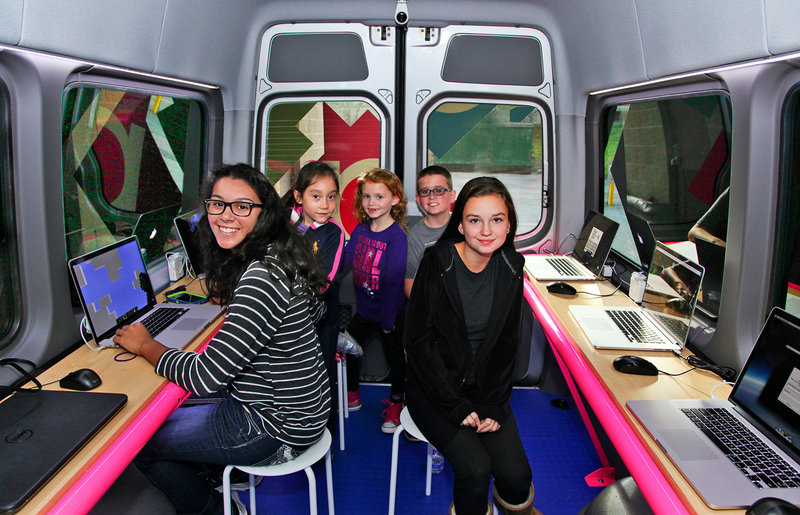 The Digital Arts Experience’s first Mobile Classroom, dubbed The DAExpress, has been running workshops, presentations, private classes, birthday parties, after school & weekend programs and more in digital art, tech and STEM-related fields all throughout Westchester since the beginning of September. The DAExpress is equipped with 10 laptops, a large display device for the instructor, and a 3-D printer which can be brought on location to run various programs for kids and teens. The cost runs $250 per hour, so with a max of 10 kids, it is essentially $25 per kid per lesson, or $200 per kid for an 8-week session. To learn more about The DAExpress, its services, and how to book a program, call (914) 644-8100, e-mail info@TheDAE.com, or visit www.TheDAE.com. Ever since Vine, the app that lets you record looping 6-second videos, debuted in January of this year, it has been a hit amongst stop-motion animators. All a Vine recording requires is that you press your thumb down on the screen to record and lift it to stop. So, for stop-motion aficionados, that easily translates to creating your own stop-motion animations. 1. Come up with an idea! 2. Plan. Rome wasn’t Vined in a day! Much like longer-length productions, you’ll need to organize your Vine by breaking down your shots and figuring out what you’ll have to do – for more complex Vines, this may involve storyboarding! This helps you stay on track and constant throughout the filming process. “I typically begin with rough sketches or written walkthroughs that help me keep the story of my Vine intact and insure consistency from start to finish,” says Danna. From here, you can figure out not only where your Vine will end up, but also what props and camera angles you may need. If you want to ensure steady shots, get a tripod or a makeshift tripod to keep your stop-motion animation looking flawless. You’ve got way more time than you think you have. 6 seconds seems long to us, but in the realm of stop-motion animation, it’s a long time. You have so many possibilities! Don’t worry, yours won’t be as bad. 4. Use the ghost feature! 5. Take a screenshot for looping! Padgham also recommends that, if you want to have a great, smoothly looping Vine, you should take a screenshot of your first shot so that you know exactly how to end your video to look just like the beginning. Happy Vining and hope you have as much fun with it as we do! Check out our Vines by following @thedaexperience. Love Vine? Check out these great Vine articles that have more tips and more awesome animations! Interested in having your kids learn stop-motion animation? Our next Stop-Motion with Legos class at The Digital Arts Experience for ages 9-12 will begin December 4th! If you haven’t seen this already, it’s Jimmy Fallon and Justin Timberlake’s hilarious jab at all our #uselesshashtags that we feel obligated to throw into every sentence, ’cause #YOLO! But seriously, check it out and #TGIF!